Follow up to my previous post about United’s international WiFi offering, I’d the chance to take advantage of United’s international WiFi service on United flight 180 from Hong Kong to Newark. I’ve been doing the EWR-HKG route since my previous post but none of those flights had a working electricity outlet which prevented me from forking over US$17 for 3 hours of internet service. On this flight, the electricity outlet on my seat is working which means I’ll have about 10 hours of internet connection for $17. Soon after leaving Chinese air space where there is no satellite coverage, I was able to login to United WiFi using my United MileagePlus credentials. The signup process was extremely smooth as my credit card on file was shown and all I had to do was to check off the terms and conditions box and the purchase button. The next thing I did was to test if I could use my paid subscription across multiple devices. The answer is YES. I was able to login to my Mac and iPhone BUT not at the same time. 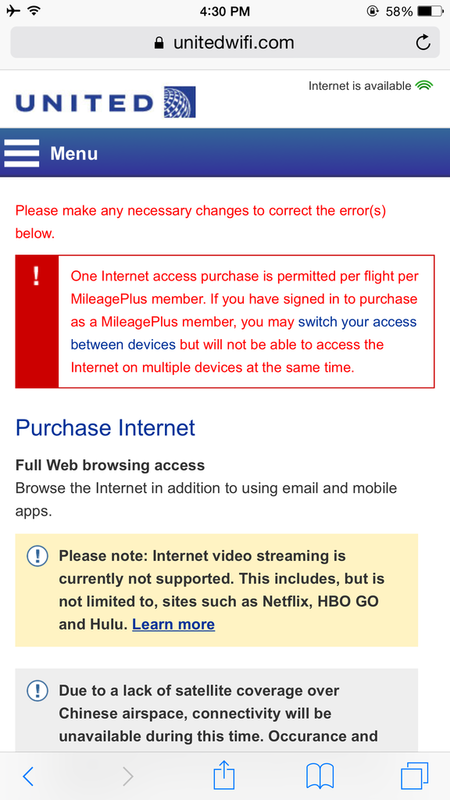 Each United MileagePlus account can only pay for one United WiFi subscription. You can however switch devices using your MileagePlus account as the login. Skype call which worked but the voice quality was unbearable. Websites with rich content (video and text) such as ESPN.com took about 30 seconds to load. In summary, I think the $17 for approximately 10 hours (losing 3 hours flying out of China air space and about 2 hours to get above certain altitude to receive WiFi) is worth it. I had booked my flight far in advance from SFO to Paris for the Paris Marathon. There was only one option for a 30K nonstop saver award which was on a Tuesday. Recently, I received an email from United about a schedule change due to the removal of the nonstop flight on Tuesday. I was booked for SFO to EWR, than EWR to CDG with a 1 hour connection. Not wanting to have a connection, I called up United’s customer service to see what they could do. I also looked up award tickets, and saw the nonstop flight on Tuesday was indeed gone on but they had one on Wednesday and Thursday for 60K miles. No more saver awards. The agent quickly saw this flight on Wednesday and asked if I wanted to do that instead. I agreed, but she had to get permission to change a revenue seat into an award seat. A schedule change on your award ticket might look like bad luck but in reality in can be a blessing in disguise. This was easy as pie, it took longer to give the representative my confirmation number than changing the flight with no fees and no fuss. Who can be your United Million Miler companion? For those of you who’ve made it to the lifetime million miles on United know you can designate a companion annually to receive the same status as you. I’ve recently hit the million miles on United and everyone has asked does your million miler companion have to be your spouse/significant other? The answer is no. Although you probably want to give your husband/wife or boy/girlfriend status, most likely they will be travelling with you anyways so they get your United perks without needing the actual status. I chose a close colleague of mine who doesn’t travel as much so he and his wife could get the economy plus seats, board early benefits, etc.. This is a much better use than someone who does travel since they most likely have status already. The only thing that needs to match up is your mailing address so have your friend change his mailing address on United to your address. The downside of this is you will be getting tons more of junk mail to recycle. For those of you interested to know what miles are counted toward your United Million Miler program, please check out our previous post.